He has painted everyone from Edgar Allan Poe, Bob Marley, Frida Kahlo and Derrick Rose in bright colors on canvases larger than the lives his subjects have led. He is Erick Roho Garcia and this talented Chicago artist lives by the credo that "life is art." 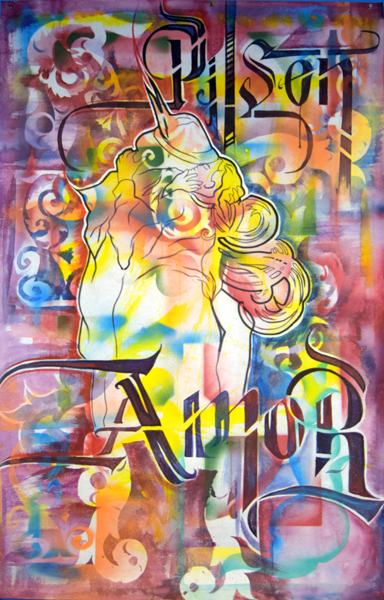 Roho's art has been turning up in galleries and street corners throughout the city drawing on cultural influences that stretch from Mexico to the South Side. A Diego Rivera for the 21st century, we recently put Roho behind the proverbial eight-ball and had him answer eight questions as to what motivates his art...and his life — since they are one-and-the-same to him. Lets get the background stuff out of the way. Tell us what got you first interested in art. What is the first piece of art you remember seeing and saying, "That's what I want to do?" The reality of the hip-hop movement. I was lucky enough to grow up surrounded by graffiti writers, older cousins and their friends creating (magic) in their black books...it was amazing to me. That and the art form of break-dancing...the moment of "That’s what I want to do!" was an easy decision for me. Growing up I had my own Graff Writers Crew and Break Dancing Crew. One of the earliest pieces of art that I was always fond of was of two Native Americans painted by Jesus “Chucho” Rodriguez. Graffiti portraits that resided by my grandmother’s house, so every weekend growing up...that was a spot to chill. Who influences your style? What artists inspired you as you were starting out and what artists inspire you today? Indulging in life’s ambiance by going out with my fellow gents, and meeting new positive people that enjoy life as I do. Traveling always broadens my perspective on life and allows me to throw my energy back at the canvas. Salvador Dali was a huge influence for me starting out. The way he communicated with his thoughts and translated them through his oil paintings always captured my attention. For the past few years I have admired German graffiti artist Mirko “DAIM” Reisser. His bold use of color with his 3-D graffiti is how I like to attack my canvas...colors, colors, colors! Your motto is, "Life is art." What is the story behind that? Why do you believe that life — in and of itself — is an art? I am a firm believer in living life to the fullest. One should follow their passion in living out their lives. But not just living out their lives with mondanity, but to live it with meaning. Making every choice worthwhile and being content with the personal decisions that you make. So make life your art form! Along with art you also have a passion for sports and for futbol in particular. You have painted many futbol players over the years, why? 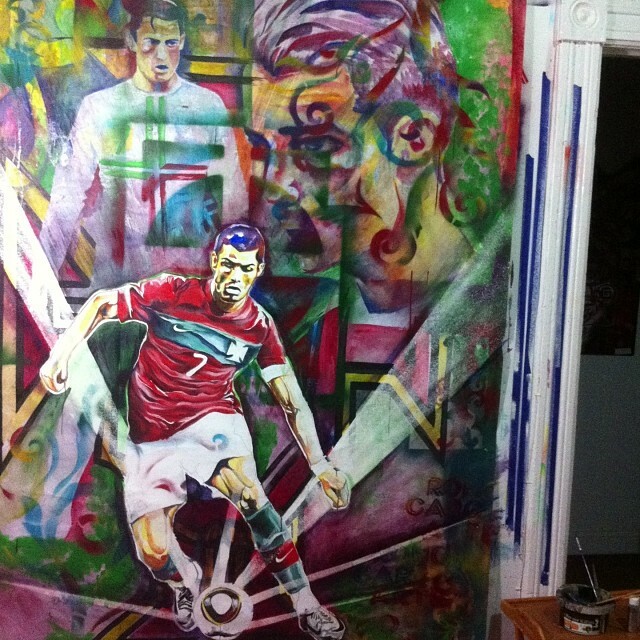 What is it about the futbol player that has you seeing them on canvas? Since I was in the 4th or 5th grade I wanted to become an artist and a professional futbol player. I have come quite close to becoming a pro futbolista trying out for two MLS teams and have been called back on both occasions to tryout again but because of how extremely competitive the pro tryouts are, I only made it to that point. Today, I am more then content with the fact that I have recently become a champion with my club team San Luis, out in Joliet, Illinois where I am originally from. Now I'm fighting for the spot of top goal scorer in the league. These experiences provide me with a keen eye on what it takes to be a professional futbolero. I give enormous respect to the high level of skill each athlete has. So when I am composing them, I do so while attempting to capture their individualistic energy, spirit and flair. Speaking of sports, tell us about your latest piece on D. Rose? How did that come about and where can people see it? After exhibiting two of my futbolero pieces at Prospectus Art Gallery, the curator Israel Hernandez thought it would be great idea to collaborate on an art show with a sports theme. I shared Israel's idea with my good friend Lessie Venardo Dixon whose specialty is in portraiture. Together, we will be opening a two-man sports theme painting exhibition on March 13, 2015 at Prospectus Art Gallery. 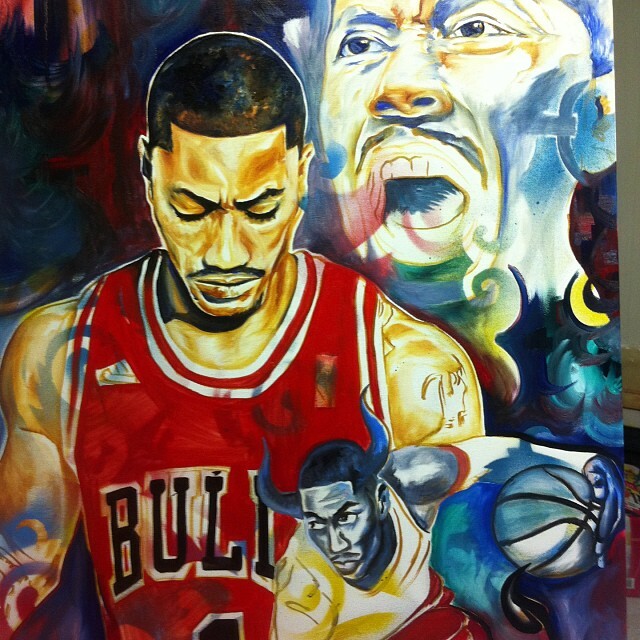 D-Rose was without a doubt my first choice for this upcoming exhibition. I respect all kinds of athletes and I will be putting my style on canvas representing other famous Chicago athletes. You are not just an artist in a community, your art adorns the community and you give back to the community through your involvement with Blue 1647. 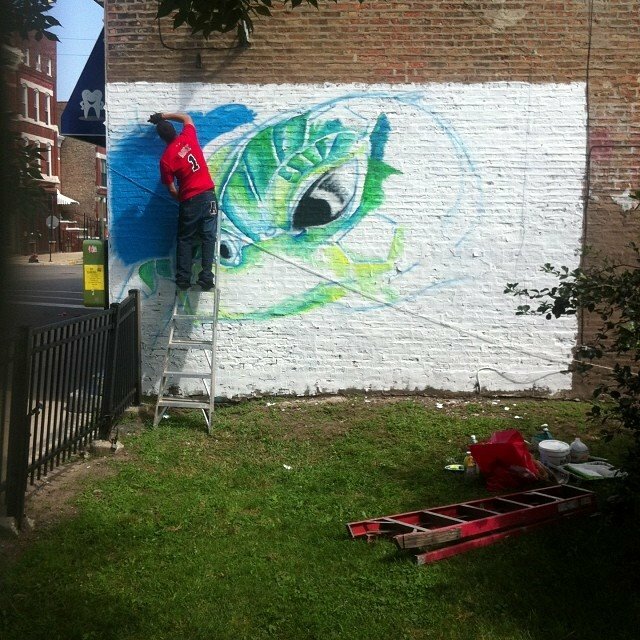 Tell us about your mural work in Pilsen and the rewards of working through Blue 1647. Before I moved to Pilsen I stayed in Greek Town and when I was looking at Pilsen as my new possible spot, I was greeted with open arms from other fellow artists. So the choice for moving to Pilsen was easy. I have only been living in Pilsen for a few years...and every year I donate a mural for my community. I keep myself intensively busy through all my activities, but I make it a point to hit up a wall for my neighborhood, which I’ve grown to love. Blue 1647 is a great productive space to work with creative minds. I walked in one day and noticed they had about three murals on the walls and asked if I could hit up a wall. Emile Cambry, the founder of Blue 1647 was pleased with the AZU piece I painted and I have since developed a great camaraderie with Emile and the Blue family. I am looking forward to collaborate on future projects with them. I am also proud to say I am a member at Blue 1647 through my pop-up gallery — EXPO Collective — with fellow partners Christina Elizabeth Rodríguez and Ricardo Gonzalez. We met through an art exhibition sponsored by the Chicago Fire soccer club and you currently have five pieces in an online art exhibition sponsored by a distiller. Is it important to you as an artist to get your art in front of as many faces as possible? Is the public display of your art the final reward in creating art? Now it is! In the past, I thought that if I composed a series of paintings and exhibited them, then I was done. I underestimated the web big time. I have become more comfortable posting up-to-date pictures of works-in-progress and receiving feedback on new projects like the Bombay Sapphire showcase. That is motivationally gratifying and gives me the momentum to push a bit further in the different facets of my art. Of course the public display of my art is a huge reward for me but I have always found that the process of making the art has always been my greatest reward. This is the main reason why I continue to enjoy art. That’s what is exciting for me, thinking of new ways to produce my art! Last Question. What’s next for Erick Roho Garcia? Where do you see yourself and your art next year and ten years form now? Next year I will still be doing my thing. Improving on every aspect of my arts. 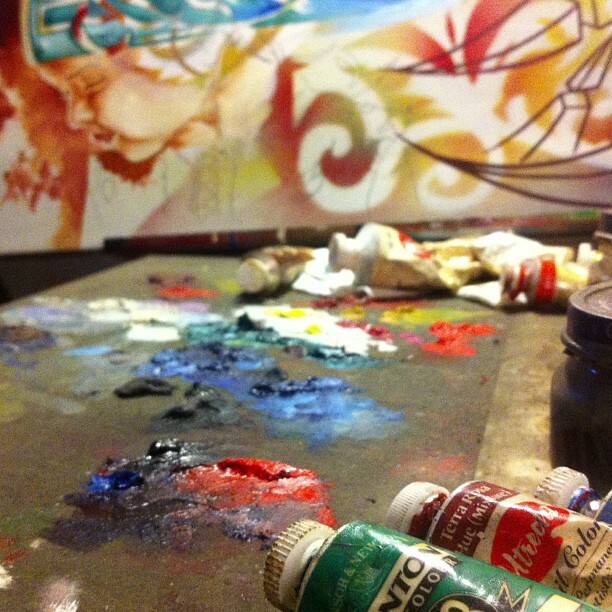 I'll be mixing them good ol’ tunes while composing a new series of paintings. But if all goes well, I will be continuing my studies and finishing my masters degree. Ten years from now I should have shot and finished a film that I am now writing and will have exhibited in Europe and South America. CREDITS: All images of original artwork ©RohoArte and used with the artist's permission. The title of the lead image is, Imagine. 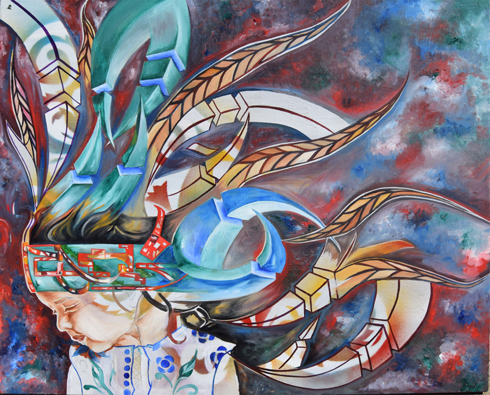 Original artwork is available for purchase by contacting the artist.